It seems to me madness to wake up in the morning and do something other than paint, considerReal style is not having a program – it’s how one behaves in a crisis. Frank Helmut Auerbach was born in Berlin, Germany. He is a German-born British painter. He is one of today’s leading international artists. 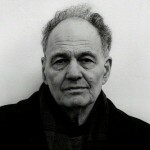 His reputation and art first came to wide public attention in 1959 when the British arts review magazine “X” published a feature story on his work. Auerbach's first solo exhibition was at the Beaux Arts Gallery in London in 1956. However, he was most frequently to be found teaching at Camberwell School of Art, where he taught from 1958 to 1965.